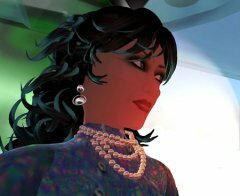 Since most people don't come past the forum often, it might be good to enable a forum subscription for it. 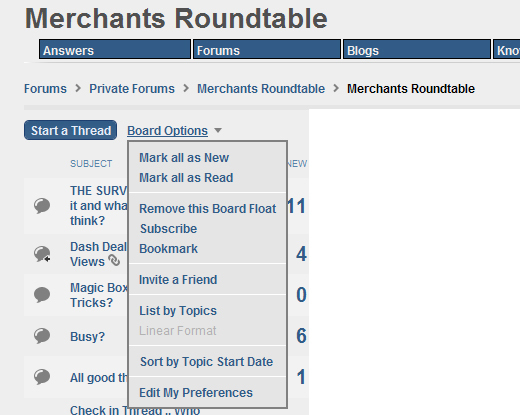 If you have a look at the merchants roundtable fourm you'll see you have a few options for getting updates - they don't seem to be available for this one. Setting up options means that people will get notified when there's something new, rather than having to wait for them to remember to come past for a look. 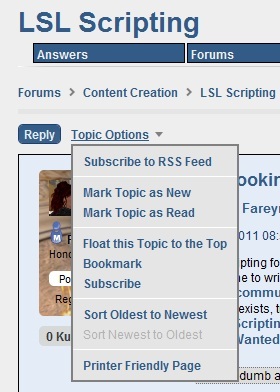 if you could organise email subscriptions for the LL blog posts as well that would be good - currently the only option is a rss feed and the option for an email notification instead would be appreciated by a lot of people I would think. 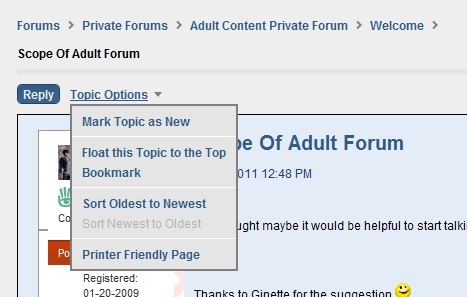 Yes, I would find a subscription option of some sort for this forum very helpful, too. Great idea. Let me see if I can get that set up! btw, it looks like they set up a sub forum with the same name as a work around to set it up..
this forum is at the level of the general discussion forum here but doesn't have the same options. at the very least the support staff should be able to do that without breaking a sweat. Thanks, Blondin. But what I would like to do, if it's possible, is to follow threads in which I've not participated, watch for new threads and so on. There are RSS feeds -- or appear to be -- for this forum that would apparently let me do that, but they none of them seem to work. I have, though, managed to subscribe to threads elsewhere in Forums this way -- in fact, I prefer that way of keeping up to having stuff end up in my email. Because this is a private forum, rss feeds are not allowed because those are not "protected". The merchants roundtable did a "workaround" to get a feed but that means our comments may not end up being private. Lithium did not have a good work around but Lexie said she would keep her eyes open. I am one of those who DO stop by this forum many times in a day, because I hope it becomes very dynamic. Notification systems (emails, RSS, etc ) are good for those who want them and they would be great options, though I think the even better scenario (if it happens) is a destination so dynamic that people check in often to get involved. The Old Days (prehistoric): there were websites and people stopped by to visit them if they were interesting and dynamic enough. Static sites eventually became ignored. You hunted for what you liked and maybe kept up with it. The slightly less Old Days (bronze age?) emails and RSS and other notification techniques meant people didnt need to check sites, they would get news sent to them. Noise and cliutter resulted, which meant that, involvement became passive and the notifications could get lost in the noise. (in other words, less investment in the process so you can zone out on it). Addendum: The benefit of this forum being 'private' is that we can be more focused / on-topic than a public forum, which is VERY dynamic to the point of drowning out content sometimes. But a private forum can be the best of both worlds if we stay active!